The new bar features classic tiki kitsch. Oakland’s newest tiki bar is here: The Kon-Tiki will hold its grand opening party on Saturday, Nov. 11. The over-the-top kitschy offering in Chinatown comes from Christ Aivaliotis and Matthew Reagan. Aivaliotis used to work at Oakland’s Flora and his cocktail developing skills have taken him to San Francisco’s Hawker Fare and Holy Mountain. At The Kon-Tiki (347 14th St.), Aivaliotis has developed a familiar tiki menu — Singapore Slings, Navy Grogs, and, oh yes, Volcano Bowls — made with premium ingredients and prices to match. Most drinks go for $13. 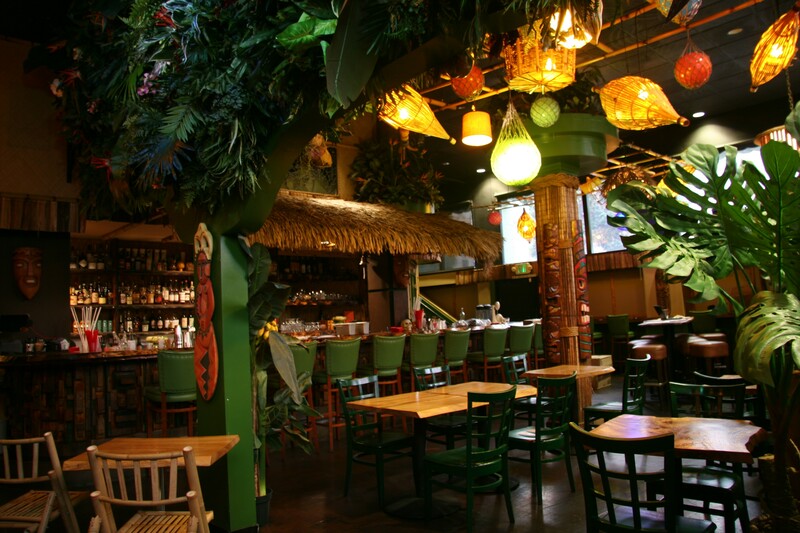 Atmosphere-wise, Aivaliotis and Reagan had a solid base to work with as the space was most recently home to the tiki bar Longitude. Much of the decor looks the same, but now there’s even more of it — more fake ferns, more colorful lights, more vaguely Polynesian aesthetics. The Kon-Tiki also has a full kitchen, and Manuel Bonilla, formerly of Oakland’s Hawker Fare, is on board. His menu includes the expected tiki bar small plates and components but in more intriguing preparations. Crab rangoon is now a dip with fried wonton skins as chips, for example. Grilled short ribs flavored with soy sauce and sesame oil come with macaroni salad and Hawaiian sweet rolls. But there are also more ambitious surprises, such as roasted octopus with fermented chili mayo, lemongrass, and breadcrumbs. Keeping with tiki tradition, there’s a pupu platter with a rotating sample of dishes for $35. Otherwise, plates range from $5 to $17.